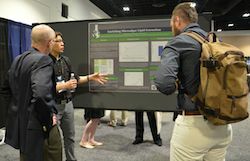 Students who are part of the Next Generation Scientists for Biodiesel had the opportunity to share their research during the recent National Biodiesel Conference and Expo. The students all have one thing in common – their passion for the biodiesel industry. I spoke with several of these budding biodiesel leaders during the poster session. Thomas Kwan is a PhD candidate at Yale and is part of the Center for Green Chemistry & Green Engineering. While doing his undergraduate he looked at emissions from diesel fuel, particularly locomotives. He then leveraged this interest into looking not at the tailpipe, but the fuels themselves for emission reductions. 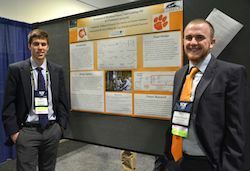 Clemson University Biosystems Engineering students Eric Monroe and William O’Connell, present their biodiesel research during the poster session. William O’Connell is a senior at Clemson University in Biosystems Engineering. He became interested in biodiesel while doing his undergraduate research, and then attended the conference last year. He’s back and this year presented his research during the poster session. 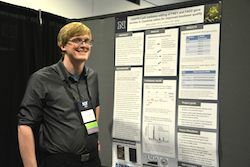 James Davis is in his fourth year of his PhD at the University of Nevada, Reno. He has a keen interest in fatty acids of seed crops such as canola or camelina sativa. He explained that his research is focused on altering the lipid profile of camelina sativa.